This is the default interface of the plugin. Each element was recorded with 3 microphones positions and you can adjust the pan, volume or mute each one independantly. You can also click on the elements on the interface while adjusting the microphones. In this panel, you can change most of the aspects of the library to make it sound just like you want. 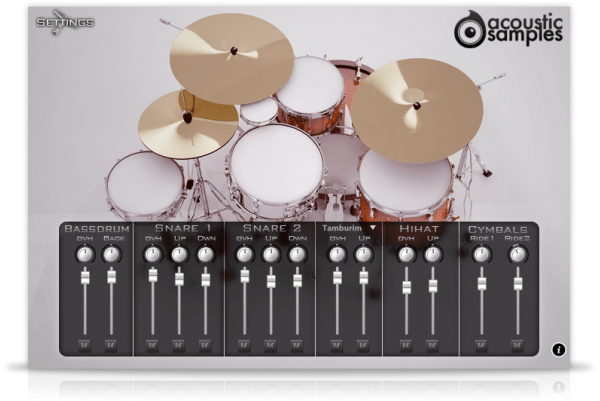 The Mapping Presets: we made some presets of the most popular drums formats (GM, V-DRUMS, IMAP, NSKIT) or you can create yours. The Midi Learn: you can remap any element to any key quickly by pressing the current key of the element you want to move, clicking on Midi Learn and the pressing the target key. The Hihat controller: we implemented an advanced hihat behavior, by default on C#2, the sample triggered will depend on the value of the controller, just like on a real Hihat. Overheads: here you can choose wether the overhead microphone position is mono or stereo. Sample cycling: there are 4 different samples for the same velocity (round robins), but you can change how they will be played (random, in sequence of 4or 3 or without it). The Sensitivity will set the minimum volume for velocity 1 and give you access to all the dynamics that you want. The Reverb. We use a convolution reverb and you can adjust the amount of reverb applied to the whole drumset. 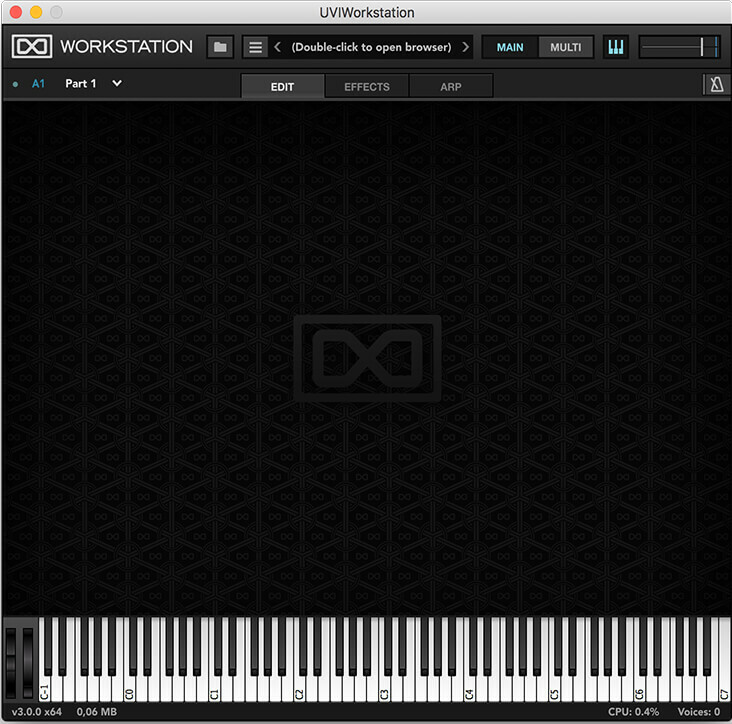 DrumTasteJazz comes with its own sample player, the UVI Workstation 3 (requires v3.0.0 or later). We provide it for free with every library that you buy, you don't need to buy an expensive sampler to use our products. 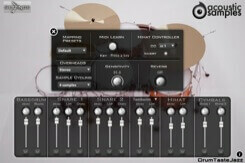 It works on Mac (10.7 or later) and PC (windows 7 or later), in standalone or as a plugin (VST / AU / AAX ) and in 64 bits only. You can find more info about it here. 1.16Gb uncompressed, 640Mb compressed in lossless flac format, around 1818 samples. 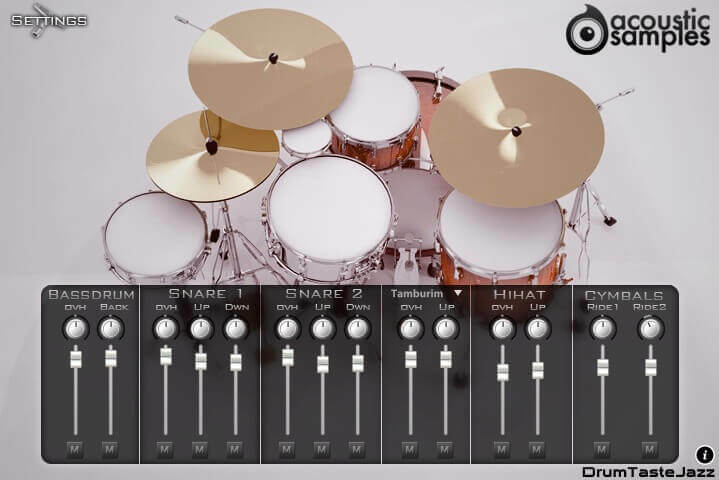 3 microphone positions for each drum that you can mix and/or disable from the interface. 4 round robins for snares, hihat and rides, 2 round robins for the other elements.. Custom mapping, you can assign every element to any key simply by pressing a key and assigning a sample. 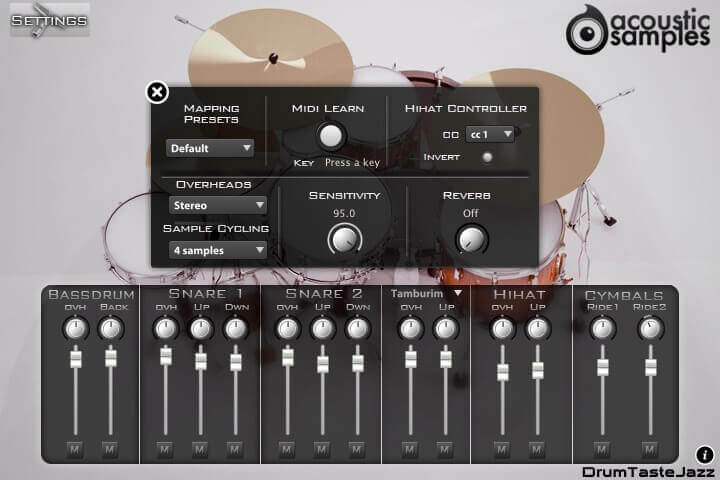 Mappings presets: GM, V-DRUMS, IMAP, NSKIT (NDK) or default one. Stereo and Multi-output versions to make the mixing possibilities even easier. Hihat with 5 levels on openess and triggering from one key depending on a controller value (any controller) and automatic closing sound. Playable instrument, right hand and left hand mappings. Detailed snares, 6 different hit positions for the 14' snare and 4 for the 10' one. Advanced UVI scripting giving you access to a simple yet powerfull interface and advanced features. Includes the demos midi files as well as about 100 midi loops recorded live on a V-Drums. We use the iLok system to protect our products and you can choose to register your license to your computer or to an iLok dongle. If you decide to use an iLok dongle, both V1 and V2 are compatible with our products. You can activate your license on up to 3 computers or iLok dongles at the same time and you can deactivate one and activate another as many times as you want. Once your order is complete, you will be provided with a serial number. You will then be able to register it to your iLok account from our website on this page (you need to be logged in to access this page). The whole process is described in the FAQ (instructions + screencast).